Downtowns across the United States are littered with mid-century concrete office buildings reaching the end of their lifespans; the question facing cities is how to repurpose these aging assets while enlivening their public-facing street walls. Located in the center of Dallas, 5G Studio Collaborative’s 1217 Main Street breathes new life into a former bank with a vivid ceramic facade cladding a five-story, office-and-retail space. For the design and fabrication of the 36,215-tile facade, 5G collaborated with Mexico-based artist Jorge Pardo. Ceramica Suro, a ceramics manufacturer in Guadalajara produced the tiles. An initial challenge for the project was the fabrication of a ceramic tile suitable for Dallas's climate—the standard 9 percent water absorption rate of tiles produced by Ceramic Suro is appropriate for Mexico’s arid climate but not for the freeze and thaw cycles of northern Texas. The design team worked closely with the fabricator to develop a tile with an absorption rate at a much lower .2 percent. Grafting the new atop the old is not a straightforward operation. “As with most renovation projects there are surprises throughout construction that must be addressed,” said 5G Studio Principal Josh Allen. “As a result, the design process extends into the construction phase due to the unexpected surprises of a renovation project.” The western and eastern elevations of the original building are composed of concrete masonry units while those to the north and south consisted of glass and stucco over metal studs. 5G Studio reached out to engineering and facade consultation firm Studio NYL for help on the installation of the tiles. The rain screen system rests on a matrix of custom-fabricatedaluminum rails, and the gridwork provides spacing between the existing wall and tile. 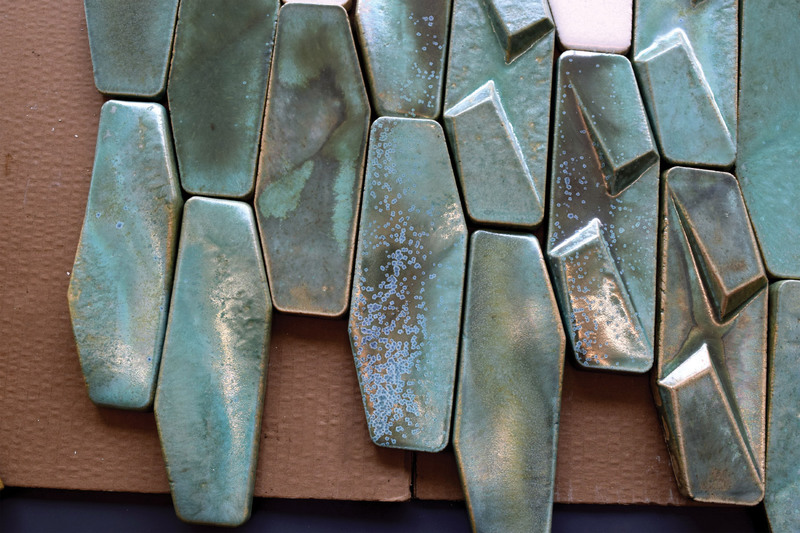 The tiles come in two different sizes: nine by nine inches, and six by six inches. There is a quarter-inch joint between each tile. "The modular framing is prefabricated to support the weight of the individual tiles offset to permit the airflow behind them and offer a substrate for the tiles to be mounted using adhesives rather than mortar," said Studio NYL founding principal Chris O'Hara. "The project is a success not just for the dynamic vision of the architects and artist but also in developing a higher performing system faster and less costly than the traditional construction method for this material." 5G Studio Collaborative's Josh Allen will be presenting a further dive into 1217 Main Street at the upcoming Facades+ Dallas on March 1. On November 9, Facades+ is headed to Boston for a full-day conference. 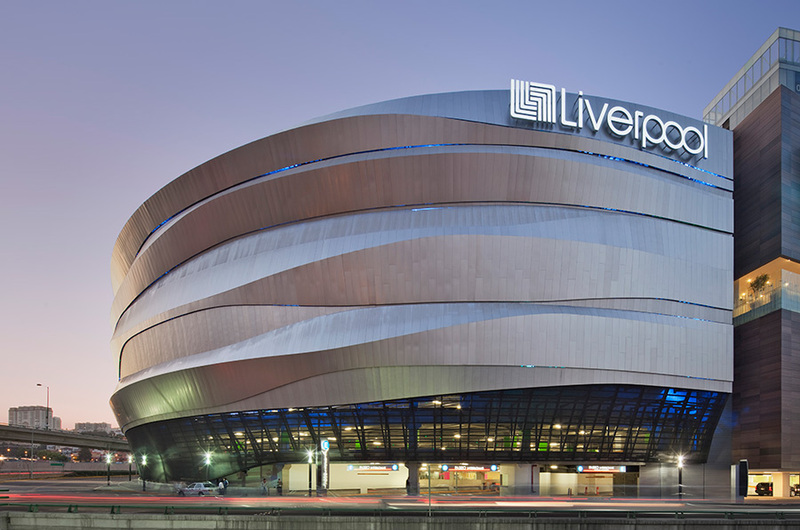 The conference features a range of facade specialists and manufacturers, ranging from stone fabricator Quarra Stone to Boston's very own designLAB Architects. Chris O'Hara, founding principal of Studio NYL, and Rishi Nandi, associate at Perkins + Will, are co-chairing the event. With decades of experience across the globe, both firms have been recognized with design awards for their advanced enclosure systems and finely executed architectural preservation projects. To learn more about what the two practices are up, AN interviewed the two co-chairs on the complexities of architectural preservation, environmental performance, and digital fabrication. The Architect's Newspaper: Both Perkins + Will and Studio NYL have been involved in numerous preservation projects. Could you expand on the difficulties of bringing historic structures up to contemporary standards, blending new design elements with the old, and the opportunities present with these projects? Rishi Nandi: The revitalization of historic buildings is challenging but pays great dividends. These buildings often represent something well beyond the program they house to their communities. Approaching the projects in a manner that is responsive to the neighborhood’s needs is critical since the structures often embody the resilience and stability of the communities they are embedded within. The most difficult part of any restoration is making sure the improvements you are making do not have any unintended consequences. For instance, many historic structures breathe differently than today's facade systems. This becomes a significant issue when one considers improving the performance of the envelope through insulation and air barriers. Understanding the hygrothermal properties of the walls is critical to ensure that potential compromising events like freeze-thaw do not occur. Matching old with new is also critical. We simply do not make component pieces the same way they were when many of these buildings were built. For example, no one is field fitting and assembling windows on site to conform to glazing dimensions that are all slightly off. The good news is that mass manufacturing is changing rapidly and customization options that did not exist in the 1980s have proliferated. We are often now able to work with fabricators in a hands-on way to create matching components that can replace those that we have to. By this, I mean that the first option in our approach is to rehabilitate as much as we can. Some of this is driven by the aesthetic. The majority of this, however, is driven by the consideration that the reuse of the existing structure and envelope has a significant environmental and social benefit. In these scenarios, we are able to keep intact the community's connection to the identity of the structure while significantly reducing the carbon footprint of the building through the reduction of primary materials. Chris O'Hara: Existing and historic buildings are a fantastic challenge. As we are always discussing sustainability, and it generally focuses on energy performance and recycled materials, it pales in response to what we can do by saving the embodied energy of an existing structure and breathing new life into it. Taking that existing structure that is either of an age where insulation was not considered and thermal comfort was managed through thermal mass and passive means, and mixing it with modern mechanical systems relying on a reduction of air exchanges–or worse yet a building designed with modern mechanical systems but an ignorance of envelope due to cheap energy–requires more analyses and more clever solutions. Management of the thermal performance of the existing building while trying to take advantage of the systems' drying potential is fun. Getting these buildings to perform at a high level is likely the most good we can do as a facade designer. What do you currently perceive to be the most exciting trends in facade design that boost environmental performance? RN: There are a lot of great products on the market including nanogel insulations, fiber reinforced polymer (FRP), and advances in glazing. That being said, as an architect, I have a tough time understanding the environmental impact of our products. We need better data from manufacturers that tell us clearly the waste stream. We need to know how much water is being used to make the products. Manufacturers should be required to help us better understand the life cycle carbon footprint of the products we are using. This information should be mandatory and should be directly influencing the way we make product selections and decisions. We can then have a more informed discussion on environmental impacts and, hopefully, then come up with a strategy on how to begin to address the concerns addressed within the Intergovernmental Panel on Climate Change (IPCC)’s most recent report. CH: Fiber reinforced polymers (FRP) and vacuum insulated systems. For the FRP, our ability to more cost-effectively thermally break and structure our faces with nearly thermally inert materials opens up possibilities in how we build. Vacuum insulated glass and vacuum sealed nanogel insulation are offering the ability to drastically improve our system U values while thinning down our assemblies. Although these technologies are still new to the market and come with a cost, like all other advances we have seen in the last 20 years or so I expect that cost to come down as we find how to use these systems more efficiently. Digital fabrication offers incredible possibilities for the mass production of individual facade components. In your experience, how is this technology reshaping the industry and your projects in particular? RN: Technology is reshaping our approach. Digital fabrication workflows are being created that are beginning to bridge the gap between documentation and fabrication. Working from a common platform has a number of benefits including allowing for a more detailed conversation on material applications and efficiencies. Robotics and digital printing allow us to create the right responsive materials that maximize the material return while minimizing waste. This increased communication is pushing more and more early involvement from manufacturers. We have employed modified delivery methods such as the integrated design process and design assist to help engage fabricators earlier to better our designs, drive a level of cost certainty and work within proprietary systems that help minimize team risk. The result is a blurring of traditional lines. The next step to me is a disruption in the way we work. We are already starting to see it with companies like Katerra, who with their digital platform are looking for ways to deliver entire projects at all phases from design to construction completion using prefabricated components and an integrated approach not yet seen by the industry. It will be interesting to see how things develop over the next 15 years and the types of efficiencies that may be gained and what it means for the way we all work and deliver projects. CH: The use of digital fabrication seems to have found its way into most of our current enclosure projects, although the aesthetic is not always driven by the technology. We have found that the speed and precision it affords makes it an important part of our toolbox. Whether it is used for an elaborate cladding geometry or for the precise fabrication of repeated parts, it has really opened up the possibilities of what we can achieve while still being conscious of the parameters of schedule and cost. To do this the designer needs to understand the craft that goes into this work. Many do not understand that even with the technologies available there is still craft. The difference between this and a carpenter is simply what is in the tool belt. Further information regarding the conference can be found here. Plate tectonics, honeycombs inspire new Denver Botanic Gardens research center. 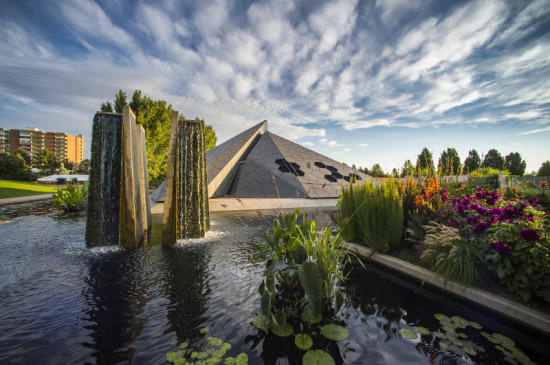 For their new Science Pyramid, the Denver Botanic Gardens sought a design that delivered more than just aesthetic impact. "They wanted an icon, but they also wanted to show an icon can be high performance," said Chris O'Hara, founding principal of Studio NYL. Studio NYL and its SKINS Group worked with architect Burkett Design and longtime Botanic Gardens general contractor GH Phipps to craft a structure to house the institution's conservation and research efforts. "People think of the Botanic Gardens as a beautiful place to go, but what most of them don't realize is what happens behind the scenes," said O'Hara. "The whole concept was to showcase that, and to educate the public not just about what the Botanic Gardens are doing, but a little more about their environment." Clad in a Swisspearl rain screen that serves as both roof and wall, the Science Pyramid's biomimetic design reconsiders the relationship between the built and natural worlds. Tasked with building a pyramidal structure with dynamic glass elements, the Burkett Design team turned to two natural metaphors. The first was the tectonic shifts that created Colorado's mountains, the second, the defensive structures built by honeybees. The geological metaphor influenced the building's form, a twisting, reaching variation on a pyramid designed to take full advantage of its site. The biological metaphor informed the building's skin, dominated by cement composite panels cut into honeycomb-like hexagons. Though they originally imagined a heavily glazed facade, Studio NYL soon realized that transparency would be impractical, given the projection elements involved in the Science Pyramid's exhibits. They opted instead for a rain screen system comprising custom-cut Swisspearl panels. The rain screen reduces thermal gain by venting hot air before it reaches the building. It encases the roof as well as the facade's vertical elements, the second such use of Swisspearl panels worldwide, and the first in the United States. "Here you don't hear about rain screen roofs often," said O'Hara. "Using the technology as a roof system was a little different." Because they still wanted some glass, Studio NYL incorporated electrochromic glazing from View. "They can tune the building—the user has a flip switch to black it out," explained O'Hara. "At the same time, you can have a visual connection to the gardens." To further boost performance, Studio NYL worked with Cosella-Dörkin to layer a UV resistant weather barrier system under the open joint rain screen. "Whereas the form was about this iconic, biomimetic structure, on a technical level, everything was about performance," said O'Hara. Fabrication and installation were complicated by two factors: a compressed timeline, and a need to work around the Botanic Gardens' ongoing operations. To help with the former, the Burkett Design team leaned heavily on digital fabrication, including having the structural steel digitally cut. As for the latter, the construction crew was forced to develop creative solutions to spatial restrictions. "There were a lot of logistical problems given that we were in the center of an active botanic garden," said O'Hara, noting that only machinery below a certain size could be brought to the site. "The primary axis we had could only go up twelve feet, to the extent that we were pushing tree branches out of the way with a broom." The design-build team came through in the end. "It's really quite spectacular," said O'Hara. But while the Science Pyramid achieves the landmark status the Botanic Gardens had hoped for, it nonetheless defers to its context—the gardens themselves. "The building is very oriented to the paths you take," said O'Hara. "Everything has a different moment. If you enter one way, you see the glass spine; if you come another, you see the canopy. It's playing constantly against the juxtaposed landscape." With only one month remaining before Facades+ PERFORMANCE opens in Chicago, our exciting lineup of the industry’s leading innovators is gearing up for an electrifying array of symposia, panels, and workshops. Be there for this groundbreaking, two-day convergence of design and construction professionals, presented by AN and Enclos, coming to Chicago, October 24-25th. Join Chris O’Hara, founding Principal of Boulder-based Studio NYL, for his day-one symposium, “Ludicrous Speed: the Design and Delivery of Non-traditional Facades on a Fast Track,” and learn first-hand from the experts the technologies and fabrication techniques that are revolutionizing the next generation of high performance facades. Register today to redefine performance for 21st century architecture, only at Facades+ PERFORMANCE. After graduating with a B.S. in civil engineering from the University of Notre Dame, Chris O’Hara began his career in New York with M.G. McLaren Consulting Engineers, where he was confronted with a host of unique structural engineering projects, from amusement park rides to New York’s Rose Center for Earth and Space at the American Museum of Natural History with Ennead Architects. Things really got going for O’Hara when he joined up with London-based Dewhurst Macfarlane Partners and began to work closely with visionary architect Rafael Viñoly. Leading high-profile projects like Viñoly’s David L. Lawrence Convention Center in Pittsburg and the Watson Institute for International Studies at Brown University in Providence, Rhode Island, O’Hara developed innovative structural solutions that allowed for the pioneering architect to exercise the breadth of his architectural expression. In 2004 O’Hara relocated to Boulder, Colorado to launch his structural engineering firm, Studio NYL, who have since become renowned for their diligent application of emerging technologies and inventive structural solutions. Their adventurous, detail-oriented work has drawn the attention progressive architects, both local and global, while O’Hara’s integration of multiple design software programs and use of complex geometries made him a literal poster-boy for Autodesk. In his daily practice, O’Hara oversees the use of BIM and other advanced analytic technologies and leads the design of innovative forms in BIM, REVIT, and direct-to-fabrication CAD/CAM softwares. Collaborating with fellow Facades+ presenters Rojkind Arquitectos, O’Hara has pushed the boundaries of structure and design on pioneering projects like the aluminum and glass enclosure of the Cineteca National and the digitally fabricated metal skin of Liverpool Flagship store in Mexico City. Designed and built in little over a year, the Liverpool Flagship store is a stunning product of international collaboration, technological instigation, and fast-paced delivery. Studio NYL lead the design for the structural elements of the atrium, rooftop park and pavilions, skylight, and stainless-steel facade for the 30,000 square meter shopping center. 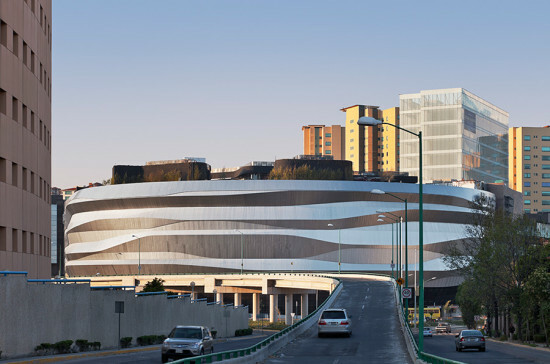 Using BIM software to coordinate the work of multiple trades on complex geometries, Studio NYL and Rojkind Arquitectos constructed the fluid folds and fine reliefs of the shopping center’s sound-blocking double-layer facade. Learn more about the secrets to delivering innovative, high-performance building envelopes on a tight schedule as O’Hara presents a series of dynamic new projects in his afternoon symposia, and don’t miss out as frequent-collaborator Gerardo Salinas, principal of Rojkind Arquitectos, presents his exciting keynote address earlier that day! Register now to cash in on our Early Bird Special, and check out the rest of the groundbreaking schedule of events at the full Facades+ PERFORMANCE site. See you in Chicago!